The Ultimate Latin Dictionary: After 122 Years, Still At Work On The Letter 'N' : Parallels Work on the Thesaurus Linguae Latinae began in 1894 and carries on to this day in a Bavarian palace in Munich, Germany. There's still a long way to go for a project with a soft deadline of 2050. 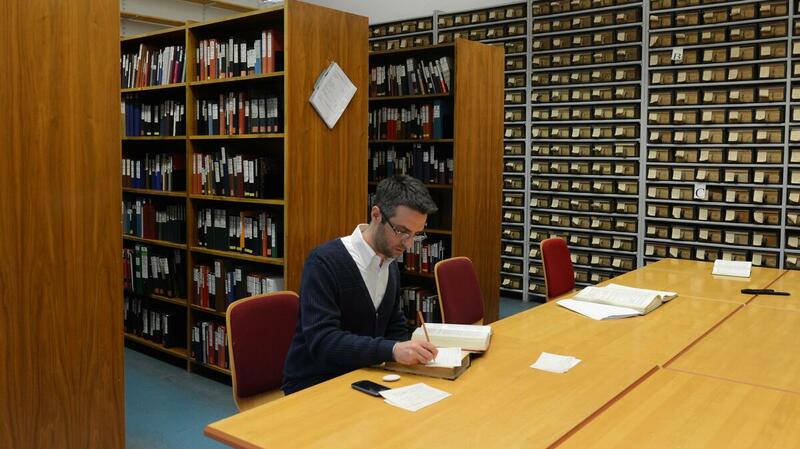 Stefano Rocchi, a researcher on the Thesaurus Linguae Latinae, the comprehensive Latin dictionary that has been in the works since 1894 in Germany. Researchers are currently working on the letters N and R. They don't expect to finish until around 2050. On the second floor of an old Bavarian palace in Munich, Germany, there's a library with high ceilings, a distinctly bookish smell and one of the world's most extensive collections of Latin texts. About 20 researchers from all over the world work in small offices around the room. They're laboring on a comprehensive Latin dictionary that's been in progress since 1894. The most recently published volume contained all the words beginning with the letter P. That was back in 2010. And they're not as far along as that may lead you to believe. They skipped over N years ago because it has so many long words, and now they've had to go back to that one. They're also working on R at the same time. That should take care of the rest of this decade. 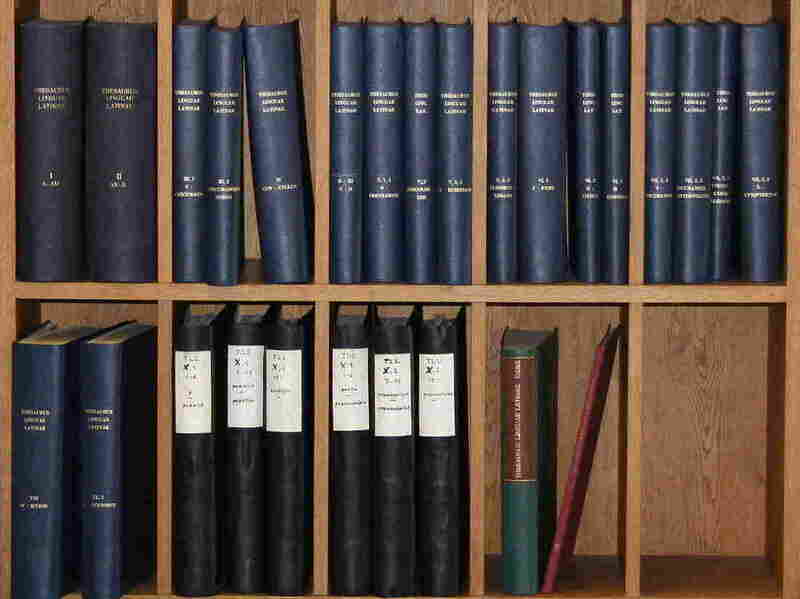 The Thesaurus Linguae Latinae was one of many big, scholarly projects taken on by the German government in the late 19th century. Through two World Wars and German reunification, generations of Latin scholars have been chipping away at the same goal: documenting every use of every Latin word from the earliest Latin inscriptions in the 6th century BC up until around 200 AD, when it was in decline as a spoken language. Befitting the comprehensive nature of the project, the scholars will also include some words up to the 6th century AD. That means poetry and history and speeches. But it also means every gravestone and street sign. It means architectural works, medical and legal texts, books about animals or cooking. 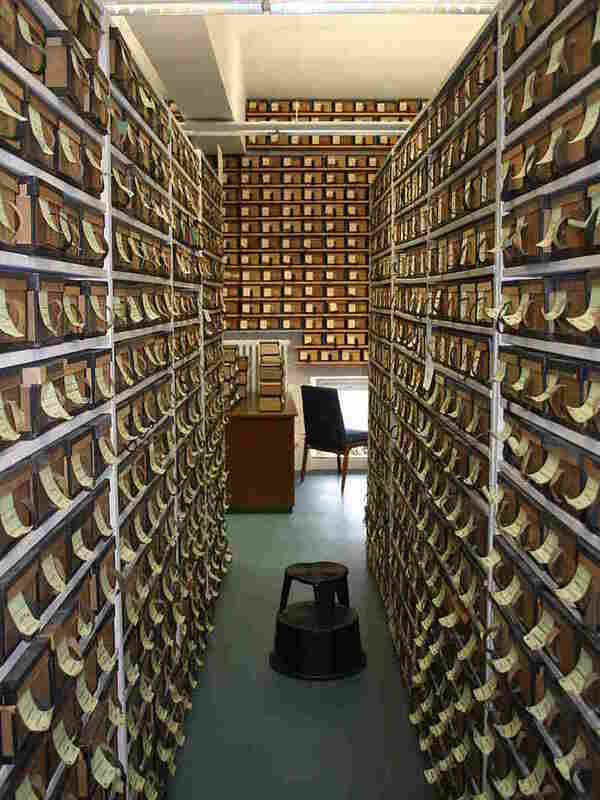 Each one of these small boxes contains more than 1,000 references to a particular Latin word. Scholars made these notes more than 100 years ago. In this case, the box contains notes for two words, redargua, which means "stopped" and reddo, which has several meanings, including "return" and "restore." "If a word is just on a toilet in Pompeii in graffiti, you'll find it with us," says Marijke Ottink, who is Dutch. She's been working on the Thesaurus for 19 years as a researcher and an editor, ever since she came to Munich. The scholars work out of the palace that houses the Bavarian Academy of Sciences and Humanities and gets funding from the German Akademienprogramm as well as academic groups around the world that support fellows working on the project, which they refer to as both a dictionary and a thesaurus. Right now, Ottink is focused on the article for the word res, which roughly translates to "thing." Just like "thing" in English, it is a very common word in Latin. And here's the thing — its meaning hard to pin down, because it appears in all kind of idioms. Ottink did not volunteer for this word. "No one volunteers for res," she says, a little ruefully. Still, she's been plugging away at it, on and off, since 2009. On her desk, there are 16 small, brown boxes. Inside each are 1,100 slips of paper. They're yellowed with age and covered in neat, black, handwritten Latin. The volumes of the Latin dictionary that have already been completed. The most recent one was the letter P, which was finished in 2010. 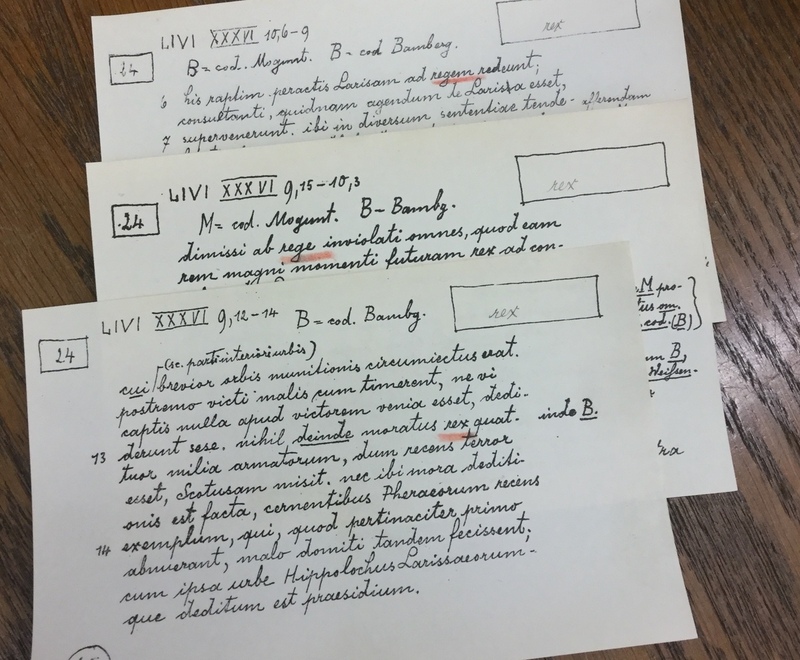 More than 100 years ago, scholars painstakingly paged through every Latin book and engraving they could find, sorting out repeats and relationships. Then, they copied out passages onto these slips — one slip for each word in each passage. 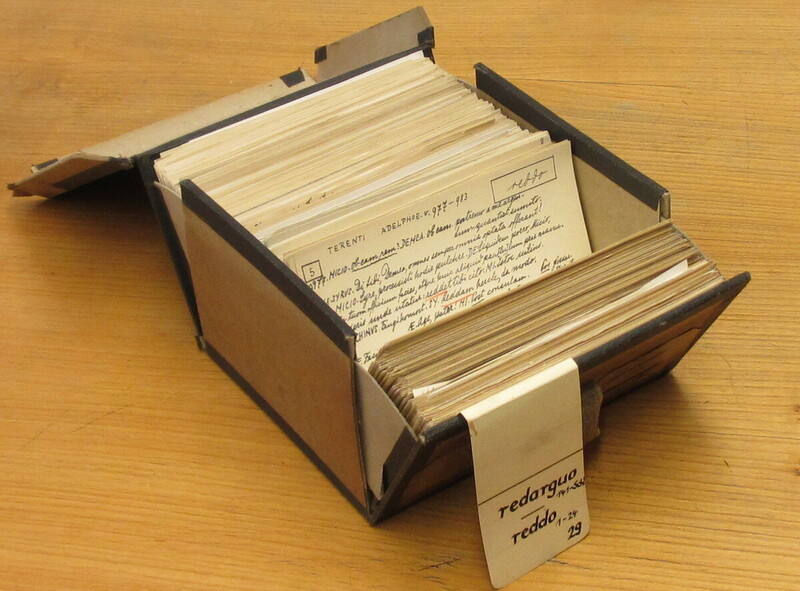 The slips were then sorted into boxes — usually one box for each word. Or in the case of res, 16 boxes. Ottink and her colleagues are still using the slips today. Each one has scholarly notations about the relationships between passages and texts — information that you can't easily get by just searching for a word on a computer database. Every slip of paper on Ottink's desk is a unique instance of the word "thing" in recorded ancient Latin, close to 20,000 references in all. It's her job to go through each example, read through the original text it came from, figure out the precise inflection of its meaning in each case and then wrestle all of the definitions into a descriptive article — written in Latin. This is especially challenging for a slippery word like "thing." "You don't get a grip of the real thing," Ottink explains, then catches herself. "Ha! Real thing!" Ottink finally has a rough draft of the res article ready. In the meantime, she's taken breaks, writing or editing articles for words with fewer references, like relego, which means to reread. Her colleague, Nigel Holmes, a Thesaurus editor, wrote the article for nam, or "for." "I have sometimes joked that I still have nightmares from when I was in nam," he admits. "But it was actually, it was easier than I thought." They both talk, though, about going over material again and again. The process of writing an article involves putting words in chronological order, but also creating branching, sub-dividing trees of syntax and semantics. Each time a word takes on a slightly different shade of meaning, it needs to be divided off into a new branch. And sometimes, halfway through a stack of slips, a new interpretation will occur to the researcher, and then they have to go back through all the slips again to make sure it didn't appear earlier. The archive contains boxes filled with notes on each Latin word. In most cases, the scholars made the notes more than a century ago. In his dialogue Timaeus, Plato (Thesaurus scholars have to be well versed in ancient Greek as well) talks about a creature, the ouroboros. It's a circular monster that's always going back to eat its own tail. The Thesaurus can look like a bit of an ouroboros, even to those working on it. It's meant to be the most painstakingly thorough reference work available. After all, there are perfectly suitable ones already, like the Oxford Latin Dictionary. The Thesaurus is meant to be just a little more definitive. But, as Nigel Holmes says, "Even when one tries to have a completely comprehensive dictionary, there's still work for other people to do afterwards. That is, there will still be aspects of a use of a word that haven't been discovered." Every time he looks back on his nam article, for example, he says, "I see things where I wish I had done something slightly differently." Worse, the earliest articles, written around the beginning of the 20th century, read more like lists of words than the more complete analyses being produced today, because the methodology of the dictionary has changed over the years. And new inscriptions are turning up all the time, new instances of words from A through P that aren't noted in the dictionary. So eventually, ideally, the scholars will go right back to the beginning again and retool articles. Or they would, Holmes says, "if anyone was willing to pay to revise earlier volumes." The task of finishing is momentous enough. Upcoming volumes, like R and Q, are full of question words and conditionals that have thousands and thousands of instances. The Thesaurus' projected finish date is 2050, but Holmes worries that they might not make that deadline. A sample of the note cards the scholars are using to assemble the comprehensive Latin dictionary. For now, though, their funding is secure. And for those working at the Thesaurus, the project is infinitely worthwhile. Marijke Ottink talks about the pleasure of reading through old architectural and legal texts, learning something new and strange every day. Years ago, Nigel Holmes quit a job as a computer programmer because he didn't feel he could be happy if he was not working with Latin. And both agree that the work of teasing out the chronological histories of words is important. Still, Holmes feels a sense of hesitation, sometimes. "It's a question, perhaps: Is that enough?" he asks. He explains that there are several hundred people who use the Thesaurus for scholarly Latin, and draw from its definitions to inform books and articles. "But is that enough for something that's so expensive, that's been going on for so long and still isn't finished?" After a short pause, he says, "I don't know."